Jook (really pronounced johk) is what the Thai people call congee: we’ll use that term interchangeably with congee and rice porridge. It can also be called khao tom, which literally means “boiled rice.” In general, jook is always made by boiling the rice grains in water from the start; khao tom is sometimes made by adding already cooked rice to boiling water and it can tend to be a bit lighter. 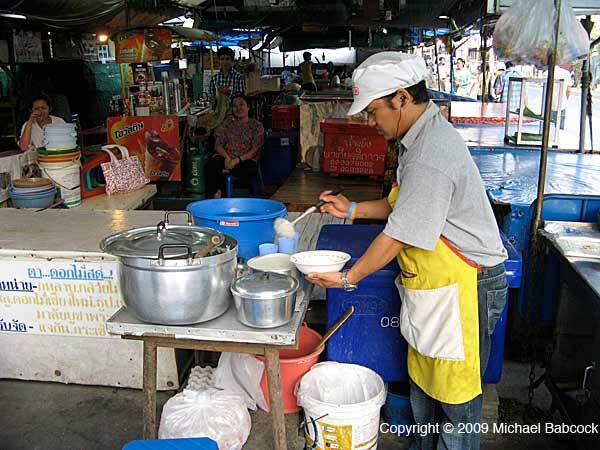 Nearly every neighborhood will have some place where you can get rice porridge, at least in the mornings and often, also, in the evening. 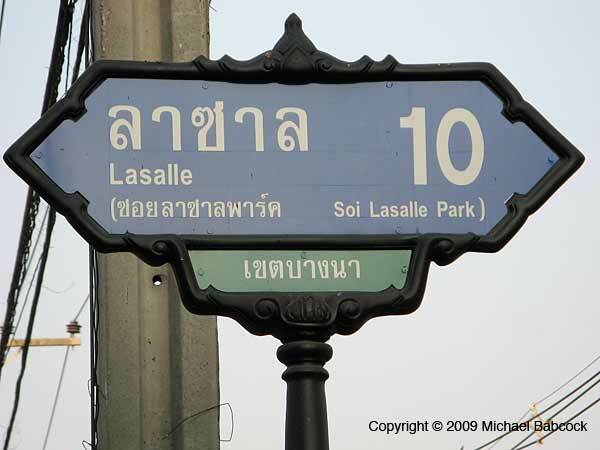 As you walk down Sukhumvit Soi 105, which is known as Soi LaSalle (pronounced “La-Sahn“), as you approach Soi 10 . . .
. . . you’ll pass a row of street food stalls under a roof. On the end you’ll notice a fairly typical-looking Thai street food stall. The shop sells rice porridge, known in China as congee and in Thai as jook. If it’s morning-time or evening time, the shop is likely open; jook is eaten mainly as a breakfast food or, alternatively, in the evenings. 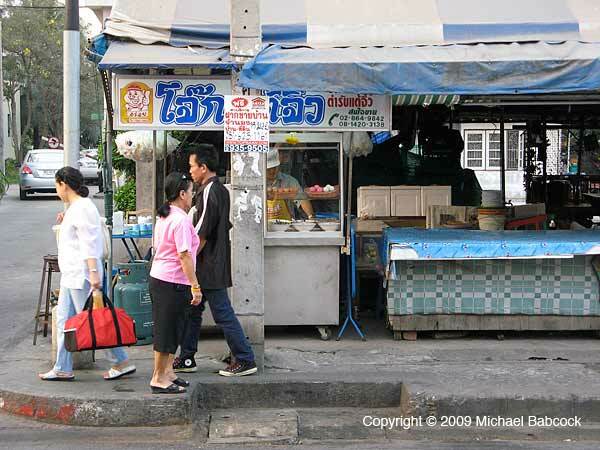 Kasma says that it is considered a good cure for a hangover so after late night drinking, a jook shop is a popular destination. It is made with delicious, healing bone broths and this helps to account for it’s efficacy in helping ease the pain of too much booze. 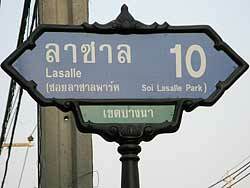 Kasma’s family owns a condominium in La Salle Park, right at Soi 10. 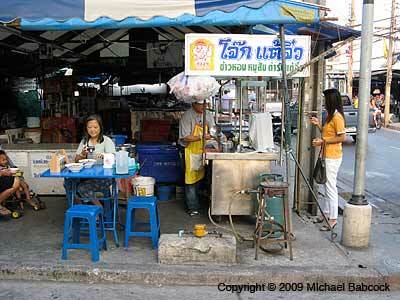 We had noticed that the two tables here were often full and we also saw people lining up to get jook to go (more later). One morning we decided to give it a try. 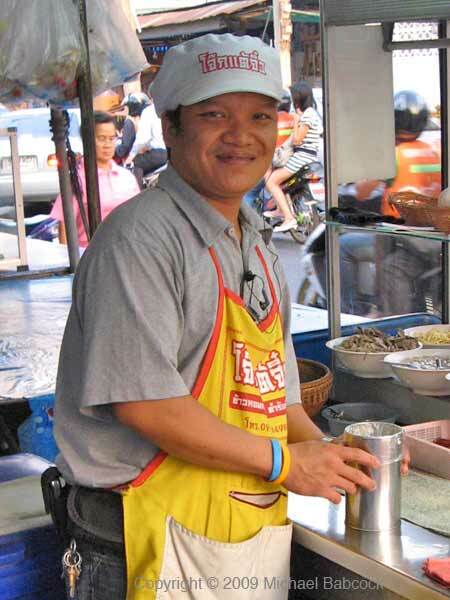 The proprietor, the paw krua (male cook, literally “father of the kitchen”), Noo (pronounced in Thai with a high tone), already recognized us from our many excursions out to graze the different food stalls on the street. Now it’s time for the rest of the ingredients. Here you see the view from the front of the stall. At the top are raw chicken eggs to the left and duck eggs (the pink are salted) to the right. The ingredients on the lower shelf, from the middle back and clockwise, are ground pork mini-meatballs, pork liver, shredded ginger, sauted mushrooms and chopped green onions. One other ingredient, fried wonton skin, is not visible. The sauted mushrooms are an ingredient I’ve not seen in jook before. It makes the bowl very tasty. Noo quickly adds them all to the Bowl. Egg, by the way, is optional when you get jook. Depending on the shop, the egg will either be raw or partially boiled. The boiled rice mixture is fairly hot, so the idea is that the egg will cook further after it’s been added to the bowl. 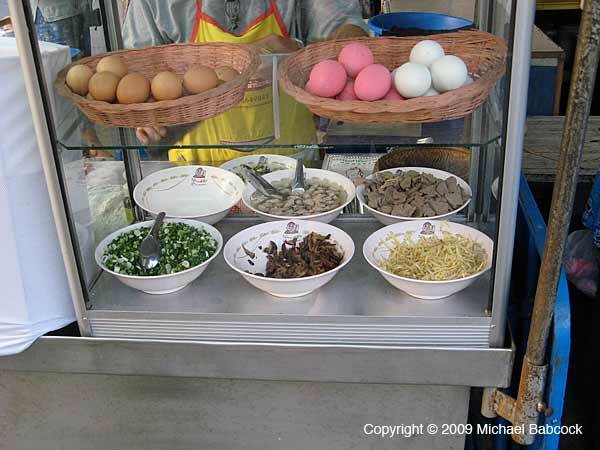 The eggs at this shop were partially soft-boiled, though the white was not yet cooked all the way through. So here’s the bowl as Noo served it. The yellow bits are deep-fried, crisp won-ton skin; they give a a crunchy texture to the bowl of jook. Once a bowl is served, you have the option of balancing the flavors to fit your own tastes. The glass jars above contain, from (our) left to right: ground, dried chillies; sugar; chillies in vinegar; fish sauce. 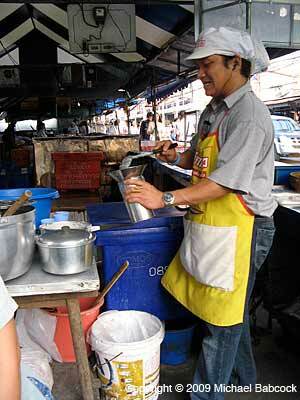 They can be used to make the jook spicier (hotter), sweeter, more sour or saltier, to the diner’s personal preference. Sugar can also be used to balance and bring out the flavors. 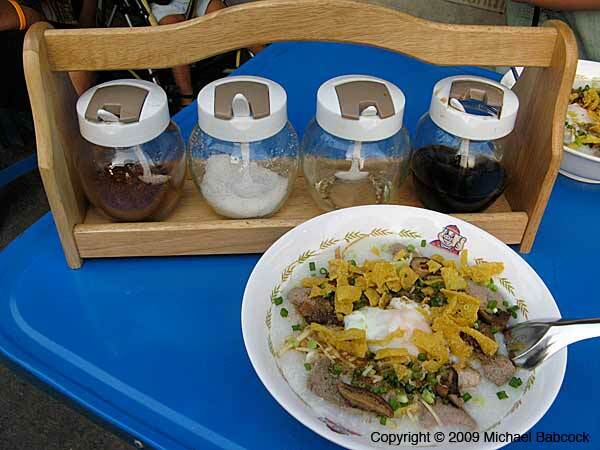 These 4 condiments (or slight variations) are also served with noodle dishes – Thai people learn from a fairly early age how to balance and harmonize flavors, a skill that we westerners mostly have to learn later. (See Kasma’s article Creating Harmonies with Primary Flavors.) Then you mix up the bowl as below and dig in! The slightly yellow cast comes from the mixed in egg yolk. You might also enjoy the blog entry on Thai Cooking with Jam, Sauce or No Sauce? Assembly is much the same, except that the ingredients are mixed in a metal cylinder that will be used to pour the (steaming hot) mixture into a plastic bag, the container of choice for to go food. 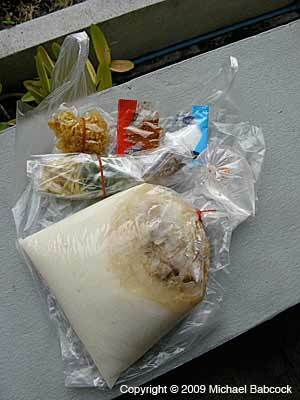 Various other ingredients are placed in a separate plastic bag so that they won’t go soggy. Here’s the complete package that we took home for Kasma’s sister. 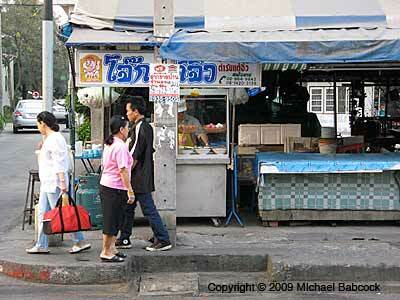 There’s at least 5 plastic bags here – Thailand uses a lot of plastic bags! 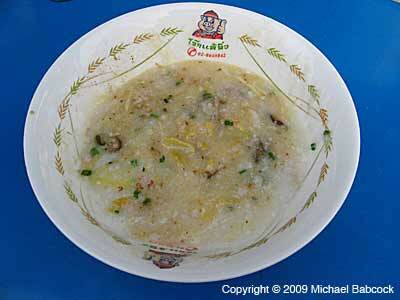 So if you’re ever happen by Soi Lasalle Soi 10 in the early morning, I highly recommend Noo’s Jook. It’s flavorful and delicious, with the mushrooms adding a wonderful flavor not usually found in rice porridge. 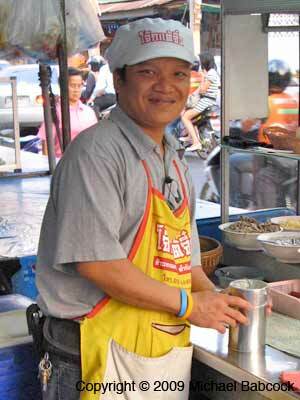 You’ll get a nice smile from Noo as well! 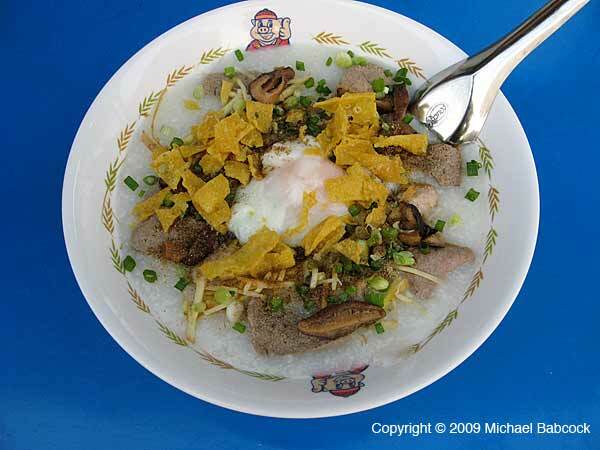 You might also enjoy Kasma’s article Enjoy Congee (Rice Porridge) and can also try her recipe for Rice Congee with Pork (Kao Dtom Moo). Written by Michael Babcock, April 2009. 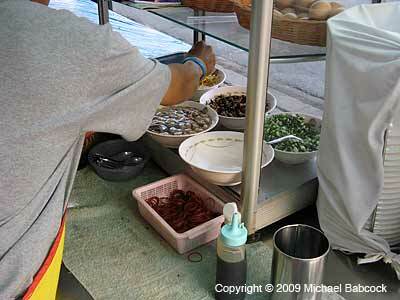 This entry was posted on Saturday, April 25th, 2009 at 12:01 am	and is filed under Food, Markets, Travel. You can follow any responses to this entry through the RSS 2.0 feed. You can leave a response, or trackback from your own site. Cool blog dude. 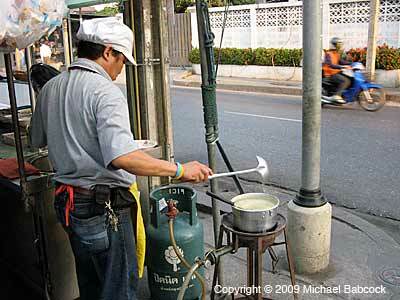 Just got back from Bangkok and became addicted to this simple but delicious recipe. Its also very healthy and nutritious… especially with the egg! and I love the way you can alter the balance of flavours with the fish sauce/ vinegar etc. Im gonna try to find somewhere in London where I can get this most delectable treat. If you can’t find it in London it’s easy to make yourself — try Kasma’s recipe for congee.